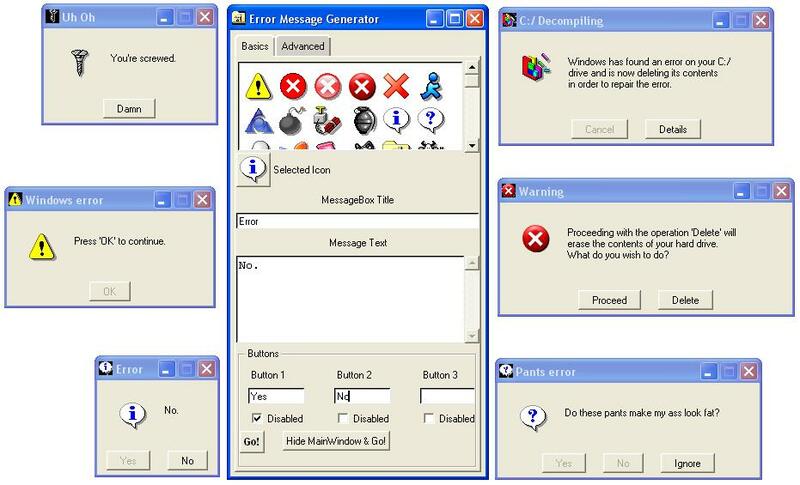 The Error Message Generator (ErrorGen) is a simple program that generates customized error dialogs. The idea was inspired by a web-based error generator which created images of error boxes. My program, however, creates "real" error boxes that can be dragged around the screen and interacted with. The command-line, scriptable version of Error Message Generator is called ZenMsg, named after the GNOME utility, Zenity. It's a version of the generator that can be provoked from batch files and scripts. Fully customizable error box: select the title, icon, and message. Create up to THREE buttons for the error box and specify what each of them say, and which ones are "greyed out"
Advanced features to make the error keep coming back until the right button is selected. A button that minimizes and renames the control window, leaving only the error dialog visible on screen. 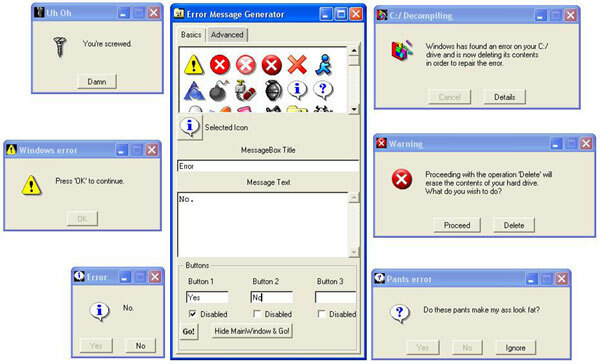 ErrorGen in action, surrounded by example error messages. ZenMsg --error -t "An error has occurred." -b "Abort" -b "Retry" -b "Fail"
The executable comes with an HTML help file. ZenMsg -? will display the same help file at the command line. The document describes how to use ZenMsg. There is no binary Linux version of this utility. The source code however is available and will execute under Linux; I've just not compiled a standalone executable (there are a handful of other utilities that do the job: see Zenity. Source code is available on the Downloads tab.